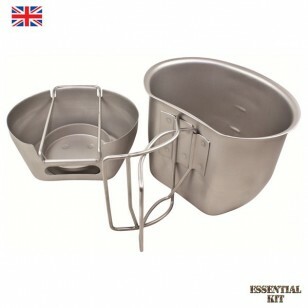 The MK2 BCB Crusader Cooking Unit is lighter, larger and has a quicker cooking time than the origina.. The original BCB Crusader Cup Canteen and Crusader Cooker. 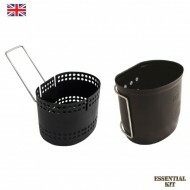 A solid and gel fuel cooker designed to m.. The original BCB Crusader Cup Canteen and Crusader Cooker. 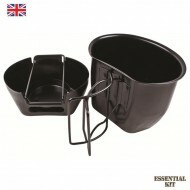 A solid and gel fuel cooker designed to meet the requirements of the military or outdoors enthusiast. The mug is designed to fit beneath the NATO (58 Pattern) water bottle as part of the BCB Complete Cooking System. Doubles as a cooking pot. Volume: 750 ml (internal measuring scale). Also available with a black PTFE coating. An innovative new solid and gel fuel field cooker. Designed to meet the changing requirements of the future combat soldier. An integral folding arm allows the cup to fit securely over a fuel crucible where gel fuel (40ml) or 2 solid hexamine fuel blocks can be lit. A small slot provides efficient air intake whilst the walls of the cooker provide shielding against the wind. In transit, the cooker nests neatly and compactly beneath the cup. Boils 500ml (17floz) of water in under 6 minutes. Integrates with the British Military issue '90 pattern water bottle and mug - water bottle fits inside the cup. Black PTFE coated finish also available.